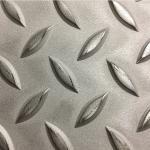 Aluminum Diamond Plate is highly reflective, slip resistant, durable and economical. Given its exceptional shine, it is used in decorative, cosmetic and architectural applications. Due to its good forming, drilling and welding ability, it is easy to fabricate. It is available in both stock and custom sizes and shapes. Although its mill finish is not as shiny as 3003, this product is still slip resistant, durable, corrosion resistant, and strong. It is used for industrial applications. Widespread use includes flooring, loading ramps, stair treads, elevator and freezer flooring. While easy to weld and machine, this product has limited formability. It is available in both stock and custom sizes and shapes. 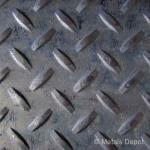 Shop for Aluminum Diamond Tread Plate Online! Stainless Steel Floor Plate, also known as Stainless Diamond Plate or Stainless Tread Plate has a raised diamond lug pattern that provides excellent skid resistance for a wide range of applications where corrosive resistance is important. While its finish is dull and not polished, it does provide the ultimate in protection from the elements along with high strength making this product ideal for marine or caustic environments. Applications include, running boards, ramps, walkways, platforms, mezzanines, stair treads, trench covers, etc. Shop for Stainless Steel Floor Plate Online! Shop for Steel Floor Plate Online!